The back is made up of the spine, muscles and ligaments, the spine is the body’s axis around which the back is centered and all the muscles and ligaments make it not only stable but also flexible. Like any other organ, placing excessive demands on the back can cause pain. However, with proper care back pain can be prevented and eased through several methods. Ideally caring for the back should start at childhood by acquiring good posture habits but apart from posture there are other common factors one can control to prevent back pain. 1. Nutrition and weight. Good nutrition with a diet rich in fiber prevents constipation. Avoiding constipation is key because it increases abdominal pressure promoting herniation of inter-vertebral disks, which is one of the main causes of back pain. Apart from constipation, a bad diet leads to overweight and obesity. Extra weight added to the body, especially the abdomen also adds work to the back muscles causing pain. 2. Footwear. Proper footwear is important at all times and not just during exercising. Shoes with completely high heels or completely flat shoes overburden the back. A shoe with heels between 0.8-2 inches is ideal as it absorbs the impact of walking, protecting the spine and prevents back pain. 3. Rest. A good night rest is great for the back, lack of enough rest can trigger back pain as during sleep the muscles relax and spinal joints regain their elasticity. A good hard mattress is also better for the back not a soft one. 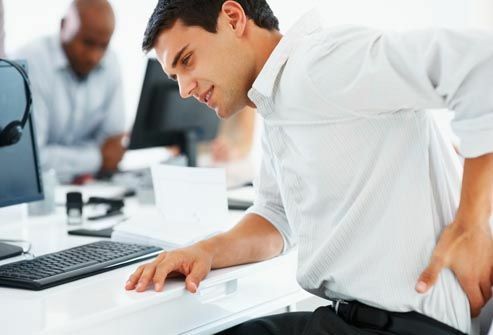 Back pain can be very uncomfortable as it prevents you from doing your daily activities. However, since the back is wide and sensitive to physical stimuli like heat and pressure, it is easier to relieve back pain. 1. Heat. One way to reduce back pain is by the use of heat, simple and effective. Heat relieves stress on the vertebrae and decreases nerve root pressure by relaxing the back’s muscles. Applying heat to the back is simple, you can use either a heating pad or a hot water bottle. 2. Massage. Another method of relieving pain is by massage. A back massage, like any other type of massage is very effective for relaxing muscles and improving circulation. A good massage promotes the drainage of blood circulating through the veins improving delivery of nutrients and oxygen while facilitating removal of toxins from the back muscles. Apart from improving nutrition of the tissues and muscles, massage also tones the muscles. When one is in pain, massage should be done by a professional. 3. Poultice. Another way by which one can relieve pain in the back is by using a mud or clay poultice. Poultice is usually applied when hot and have the effect of relieving inflammation and pain in the back muscles and joints. Poultices can be left on for 15-30 minutes increasing the calming effect. Back pains can inconvenience a person, but they can be prevented by taking care of the back and the body. In case back pain is as a result of causes like osteoarthritis, easing the pain by the above methods can make life a little more comfortable. How To Fight Against Anxiety and Depression ?